Hook, line and sinker in Slovenia. The 2012 World Fly-fishing Championships. 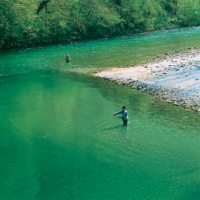 The upcoming World Fly-Fishing Championships will provide an opportunity to see your country compete against the best in the world for the chance to become world champions. With the competition scheduled to be in Italy for 2011 and in Slovenia for 2012, the excitement is building as it had never been easier to visit these countries with the abundance of low cost flights available. There is no doubt that many of you would give anything to be out there with the pros, but unfortunately there is little that can be done about this, however there are some tour operators out there that are able to offer fishing holidays to the exact locations where the championships will be held, so you can get to experience fishing there before the pros come into town. 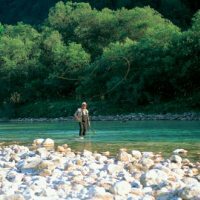 The most interesting package is being offered up by tour operator ActivityBreaks on their Slovenian World Class Fly Fishing Holiday where staying in a riverside lodge, you can test your fishing skills in some of Europe’s best fishing spots along the Sava Bohinjska, Sava and Radovna rivers where you can have the opportunity to catch Rainbow Trout, Grayling, Danube Salmon and more. With 3 night half board packages available from £375 including your license fees it is a great fishing holiday deal not to be missed for fishing enthusiasts. Deals like this are great for gaining your experience being set in a perfect environment for fly fishing, but just remember, you need to leave some fish for when the pros arrive!